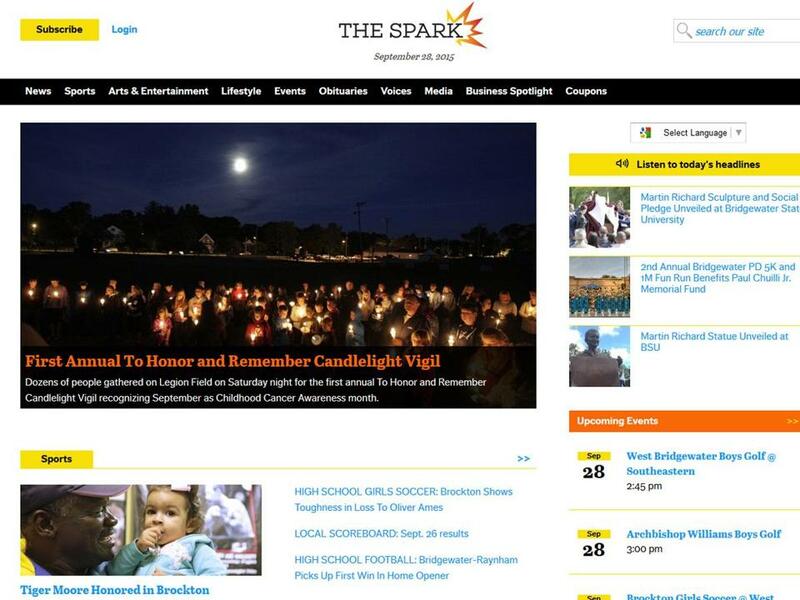 A screenshot of The Spark, a new Brockton area hyperlocal news operation. Hyperlocal coverage was a media fad that has gone out of style. People won’t pay for online news. Businesses don’t advertise in low-income communities. Journalist Emily Reynolds doesn’t buy any of this conventional wisdom, even if prospective investors don’t buy her vision. Despite rejections from banks and grant-making nonprofits, she and business partner Rob Terranova last week launched The Spark, a hyperlocal, subscription-based, ad-supported news site based in Brockton. At a time when many media companies have abandoned failed hyperlocal experiments — which were often free to read — Reynolds isn’t ready to declare the genre dead. Less than a decade ago, hyperlocal websites were hailed by some media analysts as the future of news. Combining longstanding neighborhood interests with new capabilities made possible by the Internet — cheap, instant publication and reader interaction — sites focused on daily living in tight geographic areas seemed to be everywhere. Patch Media Corp., founded in 2007, helped lead the trend, growing to more than 900 sites nationwide following an acquisition by AOL Inc. Beginning in 2008, The Boston Globe launched 129 hyperlocal websites under the Your Town brand. The New York Times tried the format in 2009 with a project called The Local, featuring sites devoted to Fort Greene, Clinton Hill, and the East Village. Despite producing some quality journalism, the hyperlocal model has proved difficult to sustain. The Times handed off control of The Local to New York University and the City University of New York in 2012, and both sites were shuttered a year later. The Globe wound down the Your Town sites last year. Patch still exists in a scaled-down capacity and even turned a profit in 2014, after AOL sold a majority stake to Hale Global, an investment firm that specializes in turnarounds. But AOL reported losing more than $200 million on the sites during its period of majority ownership. Even when AOL was pouring money into the Patch expansion, it stayed out of Brockton, one of the state’s largest cities but also one of its poorest. “Patch did aim at the more affluent towns — that was a conscious decision,” said Anthony Duignan-Cabrera, Patch’s former editorial director, who now holds the same position at Vandewater Media in New York. Former CBS News anchor Bob Schieffer, a fellow at Harvard’s Shorenstein Center on Media, Politics, and Public Policy, acknowledged the challenge of funding local news. But he said finding a successful local model is a critical mission for the media industry, calling the disappearance of strong community coverage his greatest fear in journalism. “If we don’t find some entity to do what we’ve traditionally turned to local newspapers to do, we’ll have corruption at levels we’ve never seen in this country,” Schieffer said. Reynolds, a former photojournalist at The Enterprise of Brockton, believes residents will pay for content they can’t find elsewhere. That will include a mix of breaking news and features, but she expects photos to be a big draw, particularly in youth sports. A subscription comes with unlimited downloads of staff photos. Reynolds added that The Spark, which also will cover Bridgewater, East Bridgewater, and West Bridgewater, doesn’t need huge numbers of subscribers. She estimates needing 5,000, less than 4 percent of the population in the site’s coverage area, to pay for a six-person staff and expenses. Many businesses in Brockton don’t advertise, Reynolds conceded, but she believes they are turned off by the broad circulation of other media (the Enterprise covers more than 50 municipalities) and will want to target The Spark’s narrower readership. Jan Schaffer, executive director of the J-Lab (formerly the Pew Center for Civic Journalism), said hyperlocal sites with staying power typically get by on what she called several “micro streams” of revenue: ads, donations, events, even merchandise sales. By the J-Lab’s count, there are more than 1,000 independent hyperlocal sites across the country, though some survive on the contributions of hobbyists and volunteers. Paywalls generally don’t work, Schaffer noted. While skeptical of The Spark’s business model, she said sites run by people with local ties and a passion for their communities often fare better than those started by large media companies.